It may be of little comfort to the handful of fans who were critically injured, but most of those involved in a 1993 crush at Wisconsin’s Camp Randall Stadium got off relatively lightly. Serious flaws were uncovered in the stadium design and security, which provided a wake-up call for the whole of American mass spectator sport. 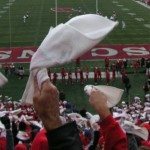 College football is no stranger to rowdy behavior, and when home side Wisconsin Badgers scraped a win by three points against rivals Michigan, fans rushed to invade the pitch to celebrate. The news of a sell-out crowd had prompted the authorities to up the number of police on duty by ten to 65, but this was patently inadequate for a crowd of nearly 78,000 people. A low mesh fence was all that separated the fans from the playing area; when they started leaping the barrier with ease, the police tried to push them back. This had the knock-on effect of causing some fans close to the fence to stumble and fall. They were now being crushed from behind while the police were still reacting by pushing the crowd back. In the commotion, appeals from police and dub officials fell on deaf ears and fans at the back of the stands still rushed forward. Things were getting critical for those in the middle of the crush. A horrified hush fell over the stadium as the crowd began to realize what was happening. Members of the young, athletic Wisconsin team acted heroically, diving into the melee to haul out the injured, many of whom were turning blue from asphyxiation. Six people suffered serious injuries, but it might have been very much worse had it not been for the actions of a few brave and level-headed individuals. Toll: Six people were seriously injured. You should know: The crush led to an overhaul in the design of Camp Randall and other similar stadiums. The security company in charge of the stadium was found liable for the poor crowd control and faced several hefty lawsuits.